Decorate outside the birthday party area so it resembles a candy filled Gingerbread house. Place really big plastic candy canes so that they line the driveway and walkway. Place colorful strings of lights on trees, bushes and over the entryway to the birthday party. Hang giant plastic candy from trees. Frosting can be cut out of white poster board or card stock and then attached around and over the party's entrance. Decorate in brown, green, red and white. Place large see through containers of candy canes tied with red and green ribbons on the table. Place colorful strings of lights around the birthday party area and on top of party tables. Make gingerbread shaped cards by tracing construction paper with a large gingerbread man cookie cutter and then cutting them out. Print party information onto the back and decorate the front to look like a gingerbread man. Trace gingerbread men from sheets of sandpaper and decorate with markers and paint. 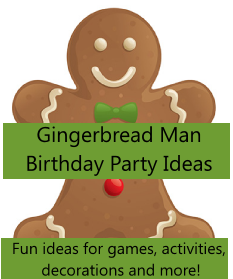 Place gingerbread house or gingerbread man stickers on plain brown note cards and write party information inside. Set out containers of different colored Play Dough and a large amount of brown Play Dough (make the brown Play Dough the party). Give the children several different sizes of gingerbread man cookie cutters. They can make gingerbread men with the cookie cutter. Bake in a 200 degree oven for 5 minutes to make them hard so the kids can take them home as party favors. They can easily be made into ornaments by poking a small hole at the top before baking. Tips: If you cover baking pans with some wax paper cleanup will be a breeze! Place a cheap plastic table cloth over the work surface before the guests start working with the play dough - after the party just pick up and toss for easy clean up. Give each guest several squares of Graham Crackers and a baggie filled with white icing (cut a small hole at one of the corners to turn it into a pastry bag). Let them get creative building their own houses and then let them decorate with small candies. Tip: Give guests a strong paper plate to build their house on - they can then take it with them as a party favor. Before the party bake (or buy) large sugar cookies in the shape of Gingerbread men. Set out icing, sprinkles and small candies so guests decorate a Gingerbread Man cookie. Tip: Wrap them up and send them home as party favors. Let guests make a life size gingerbread man. Use butcher paper or brown wrapping paper rolls and cut a piece for every party guest that is as tall as they are. Lay the pieces of paper on the ground and have the children lie on the paper. Trace around the kids. Then they can color their shape to look like a gingerbread man. The game Candyland uses gingerbread men as playing pieces. For younger children set up the Candyland game and they can play together. Cut out gingerbread men shapes with any of these foods: cookies, brownies, fruit, sandwiches, cheese, etc. Small gingerbread man cookie cutter with a container of colorful Play Dough.